grow tasty herbs, fruits and vegetables. 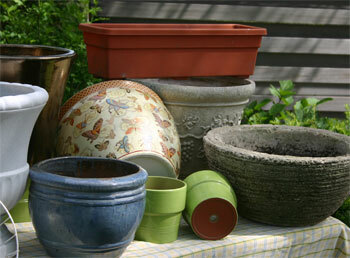 Your choice of container (along with choice of plants) communicates feelings and sets a mood. It can be amusing, a statement of value, clever, loud, quiet, classy, creative, solid, sophisticated, stylish, primitive, homespun, environmentally friendly, understated, matched and more. Larger plants may require heavier and stronger pot materials to prevent the pot from blowing over or keep the roots from breaking the pot.